Now we've got a decent number of units, we took them for a bigger spin: Charlie and I using Necron Endo-skeletons vs Paddy and Alex using Imperial Guard Resistance. The Endos had about 12 units, all armed with Plasma Guns and one Commander with a Command value of 1. The Guard comprised of two Squads. 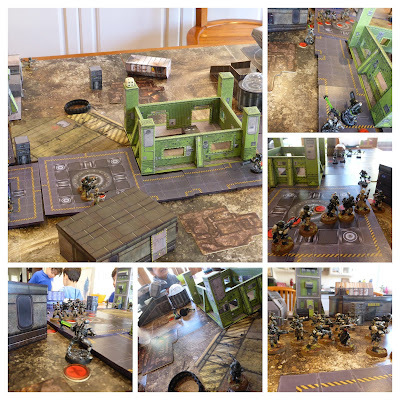 Each Squad had a Commander (Command 2), Grenade Launcher, Missile Launcher and about 8 standard Troopers armed with Plasma Guns. The scenario wasn't anything clever: advance, meet in the middle and wipe out the enemy! It was an enjoyable game, but I got the feeling that the Terminator Gensys rules aren't quite right for games of 20+ units... it might be something to do with playing with primary school (and younger!) kids too!